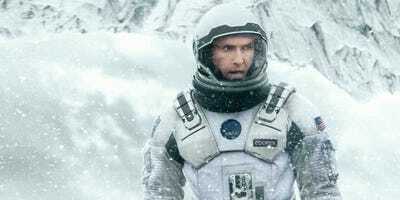 “Interstellar” is in theatres and if you head out to see it, you’ll have a total of six different ways to view the film. None of them will be in 3D, since director Christopher Nolan isn’t a huge fan of the format. Rather, Nolan’s a big advocate of IMAX and traditional film, making the movie on both 35mm film and 65mm IMAX. You’ll be able to view the film in 70mm IMAX, traditional 70mm, traditional IMAX, 35mm, 4K digital, and standard digital. If none of that means anything to you, here’s a graphic Paramount recently released breaking down slight differences between each format. How should you see it? A lot of that is going to depend on where you live and what format is actually available to you. If you want to see it on 70mm film, it’s only playing in that format in five states in addition to Toronto, Canada. 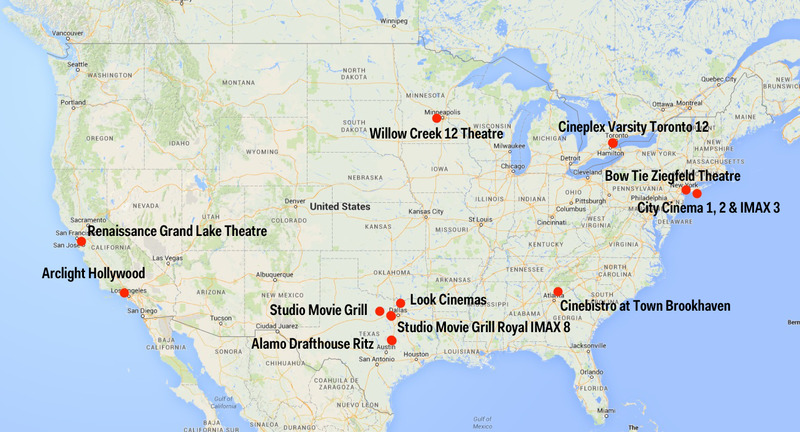 There are 11 theatres in total showing “Interstellar” in 70mm. Here are the California and New York locations. Here’s the full list of theatres showing “Interstellar” in 70mm. 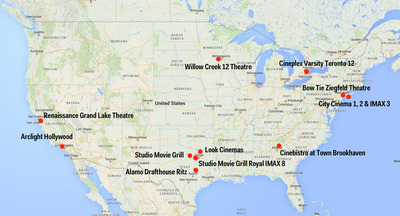 42 theatres in 20 states and Canada are showing the film in full-blown 70mm IMAX. This is how we saw the movie. We were definitely blown away by the IMAX scenes. Nolan shot a large portion of the film in IMAX so while tickets may be a bit pricier, you’re getting your money’s worth. If you’re in California and New York, here’s where you can catch it. Here’s the full list of theatres showing the film in 70mm IMAX. If you want to go old school, just under 200 theatres are showing the film in 35mm. Paramount’s website clocks the number in at 198 screens. Since the movie is heavily influenced by Stanley Kubrick’s 1968 “2001: A Space Odyssey,” and Nolan filmed much of the movie in this format, there’s something nostalgic about seeing the movie on original film. If you’re in NYC, and are a Nolan fan, you may want to head to Chelsea’s Bow Tie Cinema where the director himself tested the film out. Here’s the full list of theatres showing the film in 35mm. 313 theatres are showing the film in regular IMAX. These showings are more easily available to the public, but honestly, you’re better off seeing it in the 70mm IMAX. Most “IMAX” theatres across the country aren’t real IMAX sizes so if you want to see “Interstellar” in all of its IMAX glory, it’s probably best to watch it on the largest screens possible. In NYC, that’s the AMC Lincoln Square theatre. In California, the TLC Chinese Theatre in Hollywood and AMC Universal CityWalk in Los Angeles offer large IMAX screens. Here’s the full list of IMAX theatres. This is how the movie is widely being distributed where it’s not avaialable on film and/or IMAX. 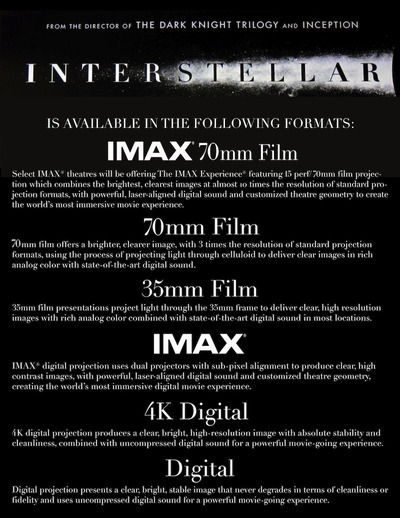 Again, since Nolan put the effort into making the movie both in film and in IMAX to be viewed in those formats, it feels like you’re losing something by seeing “Interstellar” in digital. The average ticket price in New York for digital is $US14.99 which is essentially the same price as a 35mm ticket ($US15.00).